Who are the Parents of Grand Uncle Harry Flanagan? You are here: Home / Colleen's Ancestors / #52Ancestors: Who are the Parents of Grand Uncle Harry Flanagan? My 45th entry in Amy Johnson Crow’s “52 Ancestors in 52 Weeks family history blogging challenge. I am still playing catch up, due to being sick so much of this year. My grandfather Michael John Flanagan (center) with two of his brothers. Uncle Pat is on the left. Mom and I think that is Harry on the right. This photo was most likely taken shortly before Grandpa joined the Navy at 17. My 45th ancestor is my grand uncle Harry J. Flanagan (b. 1920). Harry was my grandfather Michael John Flanagan’s (1927-1997) third oldest brother…or at least from among the brothers that Grandpa knew about (more later on the siblings he never knew). I never met Harry, and I don’t think my mom or her siblings ever met Uncle Harry. Like Grandpa’s second oldest brother Leonard Ward (b. 1917), I did not even know Harry existed until I found that very first lead about my grandfather’s family history, the 1930 U.S. Census record for their orphanage. Harry too was placed in the German Roman Catholic Orphan Home in Buffalo, New York when the boys’ parents were stricken with tuberculosis and died. Harry was 10 years old when mother Sarah Kennedy (1898- 1930) died from TB and 8 years old when father Patrick Thomas Flanagan (1897-1928) died of it. Uncle Harry was born 22 April 1920, supposedly in Bellaire (Belmont County), Ohio, where all siblings except baby brother Michael were born. I say supposedly because this is the birth location listed in his orphan records from the German Roman Catholic Orphan Home (GRCOH), and the birth county he identified in his marriage record and his Army enlistment record. Yet Harry is the only one of the Bellaire-born siblings for whom I have no official birth documentation, which means no official documentation telling me the names of his parents. I found birth records for all of Sarah and Frank Ward’s children when I visited the Family History Library in February…for everyone except Harry. Nor is there a record for a Harry born to Sarah and Patrick Flanagan in 1920. Although the older boys — Joseph and Leonard — were recorded under the surname Flanagan and as the children of Patrick and Sarah Flanagan on the 1930 US Census and in the GRCOH records, I have confirmed that these two boys (along with older sister Catherine) are the children of Sarah and her first husband Frank J. Ward. I also know that my grandfather Michael and his older brother Patrick Joseph are the children of Sarah and second husband Patrick Thomas Flanagan. Yet, I have no real proof about Harry’s birth or parentage. Although Harry consistently identifies himself as a Flanagan, and the child of Patrick Flanagan and Sarah Kennedy in documentation throughout his life. To complicate matters, when Harry was born (in 1920), Sarah and Patrick Thomas Flanagan were not yet married. They married five years later in 1925, when Sarah was already 8 months pregnant with their son Patrick Joseph. And a 1920 Bellaire city directory records Sarah still living with her first husband Frank Ward. I believe Patrick Thomas Flanagan was still married to his first wife at this time too. So Harry could be the biological child of either of these two sets of first marriages, or the love child of my great grandparents Patrick and Sarah. Harry J. Flanagan enlisted in the U.S. Army on 12 November 1941 at Fort Hayes, Columbus, Ohio (Army serial number 35037563). He joined as a private, under the warrant officers branch code. Harry had only completed two years of high school (Grandpa never completed high school either), and had worked in civilian life as a semi-skilled miner and mining machine operator. He was described as single with no dependents, 5 feel 9 inches tall, and 152 pounds. From what I can tell, Harry served in World War II. He was released from service on 28 September 1945. Harry married Anna M. Sabatino on 15 December 1944, in Belmont County, Ohio. 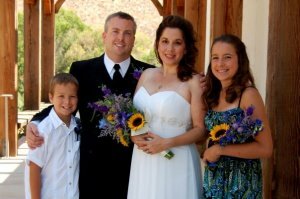 It was a first marriage for both, and Harry was still employed in the U.S. Army. 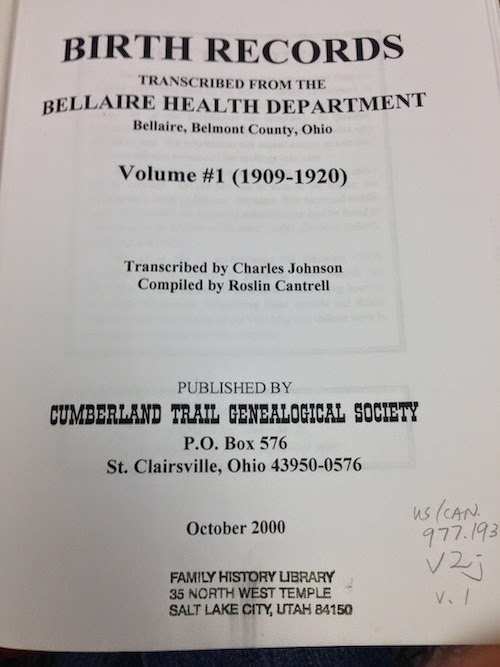 He identified his place of birth as Bellaire, Ohio, and his parents as Patrick Flanagan and Sarah Kennedy. I find no later record of children born to Harry and Anna. 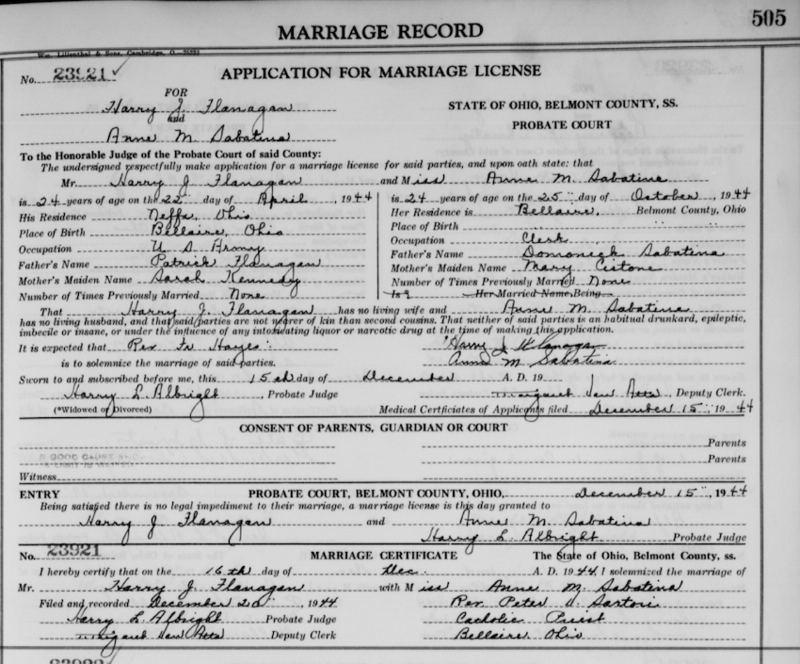 Marriage record for Harry Flanagan and Anne Sabatine. Source: FamilySearch.org. Click to view a larger image. I do not yet have proof that this is the same Harry J. Flanagan, but I find several references to an 8 October 1981 death date for him. It appears he is buried at All Saints Braddock Catholic Cemetery in Pittsburgh (Allegheny County), Pennsylvania. His wife Anne, who died 30 September 1988, is buried there too.